Responses to future changes in climatic and socio-economic conditions can be expected to vary between sectors and regions, reflecting differential sensitivity to these highly uncertain factors. A sensitivity analysis was conducted using a suite of impact models (for health, agriculture, biodiversity, land use, floods and forestry) across Europe with respect to changes in key climate and socio-economic variables. Depending on the indicators, aggregated grid or indicative site results are reported for eight rectangular sub-regions that together span Europe from northern Finland to southern Spain and from western Ireland to the Baltic States and eastern Mediterranean, each plotted as scenario-neutral impact response surfaces (IRSs). These depict the modelled behaviour of an impact variable in response to changes in two key explanatory variables. To our knowledge, this is the first time the IRS approach has been applied to changes in socio-economic drivers and over such large regions. The British Isles region showed the smallest sensitivity to both temperature and precipitation, whereas Central Europe showed the strongest responses to temperature and Eastern Europe to precipitation. Across the regions, sensitivity to temperature was lowest for the two indicators of river discharge and highest for Norway spruce productivity. Sensitivity to precipitation was lowest for intensive agricultural land use, maize and potato yields and Scots pine productivity, and highest for Norway spruce productivity. Under future climate projections, North-eastern Europe showed increases in yields of all crops and productivity of all tree species, whereas Central and East Europe showed declines. River discharge indicators and forest productivity (except Holm oak) were projected to decline over southern European regions. Responses were more sensitive to socio-economic than to climate drivers for some impact indicators, as demonstrated for heat-related mortality, coastal flooding and land use. The online version of this article ( https://doi.org/10.1007/s10113-018-1421-8) contains supplementary material, which is available to authorized users. Responses to future changes in climatic and socio-economic conditions can be expected to vary between sectors and regions, reflecting differential sensitivity to these factors (Olesen et al. 2007; Kovats et al. 2014). Future climate change impacts are typically assessed using scenarios of climate and other key drivers that are used as input to numerical models simulating the impact of interest. Such methods have been used for several decades and climate change impact models have been developed for practically all sectors at various levels of complexity and have been applied over a large range of spatial and temporal scales (e.g. Parry and Carter 1998). Multi-sectoral climate change impact and adaptation studies commonly make use of a range of such models (e.g. Warszawski et al. 2014).1 However, whilst each scenario characterises singular future conditions that are intended to be plausible and internally consistent, the selection of multiple scenarios for impact analysis is still fundamentally arbitrary. Choices are inevitably subjective, influenced by the availability of scenarios, by their representativeness in capturing uncertainties of key drivers that are regarded as important for impacts and by the processing power available to apply multiple scenarios in impact analysis. Though efforts have been made to reduce arbitrariness by defining selection criteria for climate scenarios (e.g. Dubrovsky et al. 2015) and, whilst model-based impact assessments may aspire to represent key uncertainties in projections, they are rarely systematic in doing so. An alternative to the direct use of scenarios is the impact response surface (IRS) approach (Van Minnen et al. 2000; Fronzek et al. 2010). For an IRS, a sensitivity analysis of a model to systematic changes in key drivers is conducted and the resulting impact variable is plotted as a surface comprising contour lines of equal response. Once constructed, an IRS can be used to evaluate responses to any scenario of the drivers that falls within the sensitivity range of the plot. As such, IRSs can be interpreted as providing a “scenario-neutral” analysis of impacts (Prudhomme et al. 2010). Although often lacking the internal consistency among variables that is aspired to when constructing scenarios, a key benefit of the IRS approach is its systematic analysis of the sensitivities of modelled impacts rather than relying on arbitrary and opportunistic use of scenario simulations. It also provides an opportunity to test model performance across a wide range of conditions, including those found at the high-end of projected changes that may lie outside the conventional application of many models. The outcomes can then assist in summarising and comparing model behaviour across sectors and regions. IRS approaches have been used to study sensitivities to climate variables using impact models for crops (e.g. Børgesen and Olesen 2011; Pirttioja et al. 2015), hydrology (e.g. Prudhomme et al. 2010; Weiß and Alcamo 2011; Holmberg et al. 2014; Remesan and Holman 2015) and permafrost features (Fronzek et al. 2010). However, all these examples focus on single sectors and most have been carried out at individual sites, river basins or for smaller regions. In principle, IRSs can be developed for any driving variable (climate or non-climate) to which an impact model is sensitive, but non-climate variables have not yet been examined in climate change impact studies. Socio-economic variables, which may precondition the sensitivity of biophysical responses to climate change in certain sectors, would seem to be good candidates for extending the IRS approach beyond applications with purely biophysical drivers, provided the models being used can simulate their effects. to examine the utility of the IRS approach for analysing climate change impacts and adaptation. Nine process-based and spatially explicit climate change impact models were used in this study (Table 1) with a common modelling protocol. The models represent examples from key sectors in Europe affected by climate change and are all established models that have been previously used in climate change impact assessments, including a wider set of model experiments as part of the IMPRESSIONS project1. Brief descriptions of the models are provided in Section S1 (Supplementary material) where reference to more detailed model descriptions, calibrations and examples of applications can also be found. All simulations were for a spatial domain covering Europe except for one forest model—LandClim—which was applied at a single site in Portugal. Results were aggregated to eight European sub-regions (Fig. S1, Supplementary material). A modelling protocol was developed to ensure consistency of the approach, so that we could compare the results of each model’s sensitivity analysis.2 The protocol defined the baseline period to be 1981–2010, although three models (of human mortality, crop yield and net primary production (NPP)) used 1981–2000 instead because their standard baseline dataset did not extend to 2010. The sensitivity analyses included at least two input variables (climate-related and/or socio-economic) and were designed such that these variables were perturbed simultaneously over ranges and intervals defined in Table S1 (Supplementary material). Other variables may also be important, but are assumed to be fixed in the perturbations (e.g. 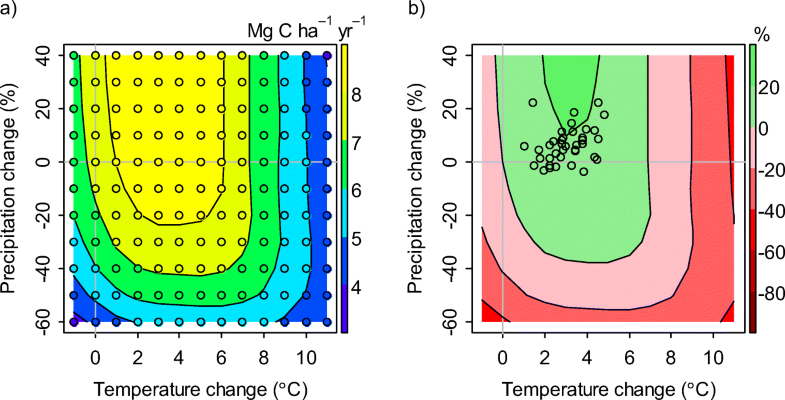 other climate variables are fixed when perturbing temperature and precipitation for modelling plant response). Although the sensitivity analysis itself is scenario-neutral, it should also explore changes that are credible, hence the ranges were defined to be wide enough to encompass projections of long-term changes for the twenty-first century that plausibly could occur somewhere in Europe based on existing information. Long-term changes in annual mean temperature and precipitation were defined to accommodate the range of probabilistic twenty-first century projections of Harris et al. (2010) for all European sub-regions. These were chosen primarily because of their possible application in a follow-up study of impact risk. Though based on the more moderate SRES A1B emissions scenario, they show a wider spread than the high-end RCP8.5 CMIP5 ensemble analysed for the IPCC (see below) because they account for parameter uncertainties in modelled physics in addition to inter-model differences (as for CMIP5). Regional sea levels were increased up to 2.5 m, the upper 99th percentile of regional projections for northern Europe given by Grinsted et al. (2015). Atmospheric carbon dioxide concentration [CO2] levels were varied to cover the range of Representative Concentration Pathway (RCP) projections until 2100 (van Vuuren et al. 2011). Changes in population and gross domestic product (GDP) covered ranges for all European countries across Shared Socioeconomic Pathway (SSP) projections out to 2100 in the International Institute for Applied Systems Analysis (IIASA) database3 (Riahi et al. 2017). Ranges for changes in agricultural land use encompass approximately the 10th to 90th percentile range across multiple SSP-based model applications for alternative assumptions concerning future trends in crop yields due to technology and the future extent of protected areas for an area including our study region (Popp et al. 2017). All simulations, except for the two forest models, were carried out on a regular grid covering Europe (Fig. S1, Supplementary material). Simulations were conducted for the baseline period and for perturbations of the baseline values of the selected drivers (Table S1, Supplementary material). Simulation results (impacts) were aggregated as period averages (or other temporal statistics) for each of the eight European regions such that a single modelled value was recorded for each perturbation of the sensitivity analysis per region and response variable. These were plotted as contoured IRSs with respect to the axes of the two drivers by interpolating bi-linearly between impact values across all combinations of perturbation intervals (Fig. 1a). IRSs were also calculated that show the relative difference between the simulated baseline (unperturbed—at the intersection of the zero change lines in Fig. 1a) and perturbed responses, hence distinguishing areas of increase (green shading) and decrease (red shading) of the response variable (Fig. 1b). For a sub-set of impact indicators, sensitivity to changes in precipitation and temperature was estimated as the average rate of change per 10% precipitation change and per 1 °C temperature change (Fronzek et al. 2018). To ensure that the climate changes considered were consistent with model projections for a given region, these were calculated only for perturbations over that portion of an IRS encompassing the 5th to 95th percentiles of twenty-first century CMIP54 global climate model (GCM) projections for ‘high-end’ RCP8.5 forcing, hence covering smaller ranges than the probabilistic projections used to define the whole IRS (see above). We used a sub-set of 38 projections (van Oldenborgh et al. 2013, Table AI.1) to calculate period-averaged changes in annual mean temperature and precipitation for the land grid cells of the eight regions. Portions of the IRS that were analysed therefore differed slightly between regions. For the same sub-set of impact indicators, the IRSs were also used to estimate impacts of the 38 GCM projections. These were calculated from the IRS by interpolating to the locations of perturbations corresponding to each climate projection (Fig. 1b). IRSs for changes relative to the baseline for impact variables relevant to agriculture (i.e. crop yield, NPP, mean river discharge and intensive agricultural land use) showed general increases in these impact variables as precipitation increased, and decreases as temperature increased (Fig. 2). The patterns of yield response of the three crop species showed large regional variation, though there were similarities between crops in Central, North-eastern and East Europe. In Central and East Europe, yields of the three crops declined under all climate perturbations except precipitation increases for temperatures close to the baseline. Yield increases dominated over the Iberian Peninsula, North-eastern Europe and the Mediterranean, with the maximum yields simulated under wetter and warmer conditions. 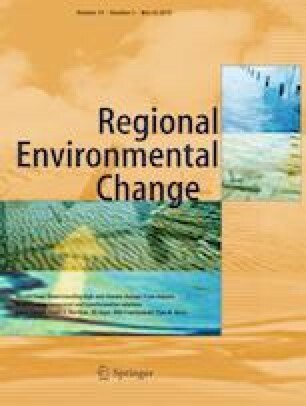 Regional changes in NPP showed smaller differences between the eight sub-regions compared to the crop yield IRSs, suggesting that the local adaptation of natural ecosystems shares characteristics regardless of the prevailing regional climate. There were increases for wetter conditions, with maximum values simulated at baseline temperatures in the Iberian Peninsula and Mediterranean but under warmer conditions in other regions. Correspondingly, a tipping point of NPP decline with higher temperature can be observed in all regions, varying between about 2 and 7 °C; least in Iberia and the Mediterranean and greatest in the British Isles and Alps. Changes in mean river discharge were mainly affected by changes in precipitation, with decreasing precipitation reducing river flows (Fig. 2). Although the European regions differed little in the shape of their IRS, the strength of the precipitation response varied across Europe. For example, a 50% precipitation decrease with no change in temperature resulted in declines ranging between 62% in the Alpine region and 75% over France reflecting the regional differences in evapotranspiration. The land use simulations did not meet European demand for food (see Supplementary material S1 for an explanation of how food demand is handled in the model) under perturbations with decreases in precipitation, despite increases in intensive agricultural land use area in most regions, for baseline [CO2] levels, population and technology (hatched area in Fig. 2, bottom row). Hence, results for the simulated land uses in this part of the IRS should be interpreted with caution. Changes in the proportion of intensive agricultural land use decreased for increases in precipitation and temperature in all regions except Central Europe. The decreases coincided with increases in crop yields in most regions, especially the Iberian Peninsula, France and Mediterranean. The CO2 fertilising effect reduced the extent of intensive agricultural land in all regions except the British Isles for different levels of warming and the Iberian Peninsula and Mediterranean for large warming (Fig. S2 top row, Supplementary material). Population increases also led to an increased extent of intensive agricultural land, due to land use conversion driven by increasing food demand and associated food prices under assumptions of constant imports. The increases in intensive agricultural land use were up to a region-specific threshold that was between 15 and 38%, except for North-eastern Europe, where the threshold was much larger, with a more than five-fold increase for population increases of 60% or larger (Fig. S2 middle row). The same thresholds of increases in intensive agricultural land were reached for negative technological change, as it decreases agricultural productivity leading to a need for increased agricultural area to meet food demand. Increases in technology consistently decreased intensive agricultural land use in all regions (Fig. S3, bottom row). The productivity of the five simulated tree species increased under wetter conditions in all regions, whereas the temperature optimum varied between region and species (Fig. 3). Baseline conditions were not economically viable for all five species in all regions, but in these cases, most showed viable forest growth under perturbed conditions (e.g. Norway spruce in Central, North-eastern and East Europe). There were similarities in response to changes in temperature and precipitation between the two temperate broadleaves (European beech and Sessile oak) and the two conifers (Scots pine and Norway spruce). 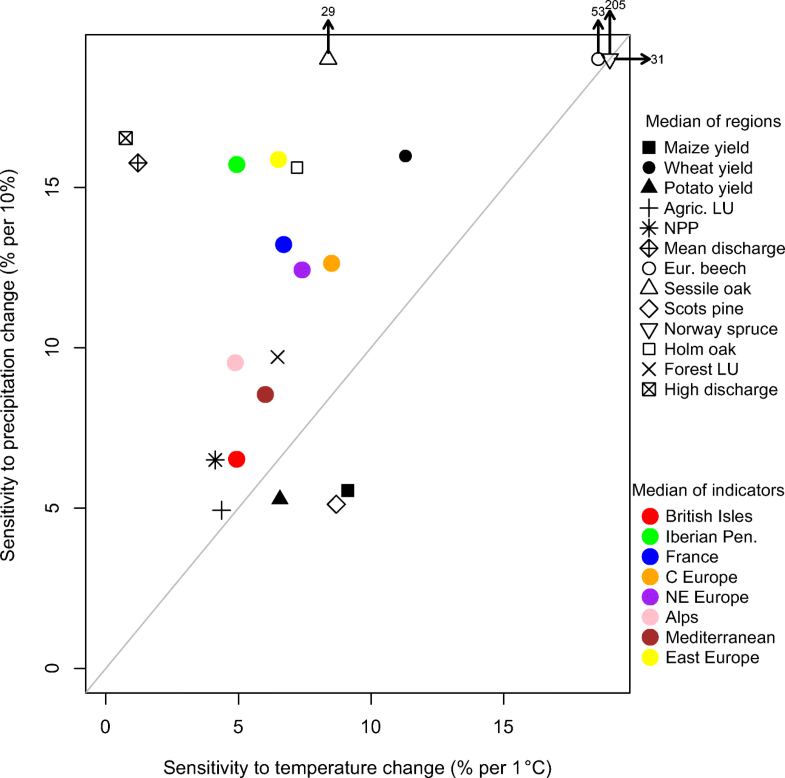 Distinct temperature and precipitation thresholds can be identified from the IRSs, for example a sharp decline in productivity can be seen for European beech and Sessile oak in the British Isles for warming of 6 °C or more. For European beech, Sessile oak and Scots pine in the Alps, a clear threshold was found for precipitation decreases of more than 20%. Large increases in productivity (with an increase in basal area of more than 40 m2 ha−1) were simulated for several locations at their respective optimum perturbation. 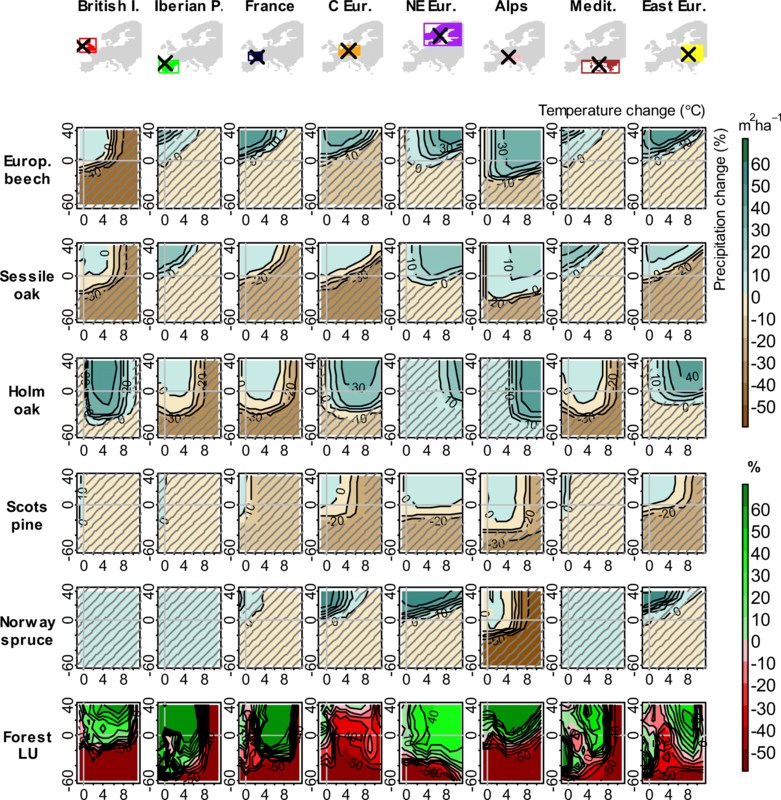 The LandClim simulations of an oak forest for a single site in Portugal showed increases in forest biomass under wetter and cooler conditions, but decreases under drier and warmer conditions (Fig. S3a, Supplementary material). The pattern of the IRS was similar to that for Holm oak simulated with ForClim (cf. Fig. 3), although the latter was for a 10′ × 10′ grid cell located further north in the Iberian Peninsula. The IRS pattern of response for the pine forest in Portugal simulated with LandClim was similar to that of the oak forest, but with a wider spacing of the contour lines indicating a lower sensitivity to climate changes (Fig. S3b, Supplementary material). The percentage of forest land use increased for wetter and decreased for drier conditions for most regions, except in Central Europe, where decreases were simulated for nearly all perturbations (Fig. 3, bottom row). The patterns of changes were largely opposite to those of intensive agricultural land use (see Fig. 2, bottom row). Biodiversity intactness, as measured by the Mean Species Abundance (MSA) index (see Supplementary material S1), decreased with warming and more intensive agricultural land use (Fig. 4). Although the absolute values differed strongly (not shown), the shapes of the IRSs showing changes in MSA relative to the baseline value were similar for all regions. The strongest relative decreases in MSA of up to − 50% for large warming were found for the Iberian Peninsula and the weakest (up to ca. − 30%) in North-eastern Europe. 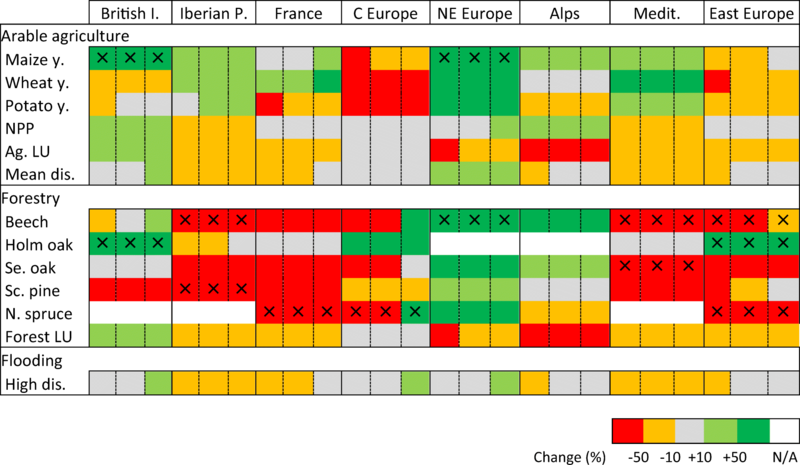 The effect of increased pressure from intensive agricultural land use, measured at no temperature change, was strongest in the Mediterranean, Iberia and France. Heat-related human mortality was projected to increase with warming and larger populations, with very similar IRS patterns of relative changes for the eight European sub-regions (Fig. 4). The largest temperature sensitivity was simulated for the British Isles, where a ten-fold increase in 30-year average mortality was simulated at 5.7 °C warming for present-day population, albeit starting from the lowest baseline mortality of the eight European sub-regions of 1322 persons year−1. For the other regions, the ten-fold increase was reached at a warming between 7.1 °C (Mediterranean) and 9.4 °C (Central Europe). The number of people directly affected and the monetary damage caused by a 100-year coastal flooding event increased with sea-level rise (SLR) combined with population and GDP growth, respectively (Fig. 4). The relative increase in monetary flood damage was larger than the increase in the number of people flooded. Incorporating current protection levels in the analysis decreased the number of people affected and flood damage, but their effectiveness varied between European regions. For example, under a c. 50-cm sea-level rise, flood damage and the number of people affected were reduced to less than half in Central, East and North-eastern Europe and France (Fig. S4, Supplementary material). IRSs of changes in high river discharge showed strong sensitivity to perturbations in precipitation but weak responses to changes in temperature except under moderate warming in NE Europe where a shorter snow season decreases high river flows (Fig. 4). IRSs were similar to those of mean river discharge shown in Fig. 2. The sensitivity of the climate-driven impact indicators is summarised in Fig. 5. This plots the median sensitivity to temperature and precipitation changes (i.e. the relative differences in the impact indicator per 1 °C temperature and per 10% precipitation change) by region across all indicators (coloured points) and by indicator across all regions (black symbols). For the set of impact indicators considered, the British Isles was the region with the smallest sensitivity to both temperature and precipitation (across all indicators), whereas Central Europe had the strongest median response to temperature and Eastern Europe to precipitation. The Iberian Peninsula had the largest precipitation to temperature sensitivity ratio, implying a relatively stronger response to precipitation than temperature compared to other regions. The British Isles showed the lowest ratio. The median sensitivity to temperature of indicators across the regions was lowest for the two river discharge indicators and highest for the productivity of Norway spruce (Fig. 5). At the low-end of sensitivity to precipitation were intensive agricultural land use, maize and potato yields and the productivity of Scots pine, whereas the largest precipitation sensitivity was found for Norway spruce. For crop yields assuming present-day rainfed and irrigated areas, wheat was around three times more sensitive to precipitation than potato and maize. Similarly, the two land use indicators showed contrasting sensitivities with forest land use being more sensitive to precipitation than agricultural land use. The variation of sensitivities across individual indicators and regions is large for most indicators (Fig. S5, Supplementary material). Exceptions are the two discharge indicators and, to a lesser extent, NPP and agricultural land use, whose regional values clustered around a small range of sensitivities both for temperature and precipitation. To complement the results on sensitivity across the IRSs, Fig. 6 depicts averaged responses for each region and climate-driven impact indicator. Responses are medians across the 38 perturbations defined by the CMIP5 RCP8.5 GCM projections for the end of the twenty-first century. North-eastern Europe showed increases in yields of all crops and productivity of all tree species, whereas Central and East Europe showed decreases in these indicators (Fig. 6). In regions of southern Europe (Iberian Peninsula, France and Mediterranean), indicators of river discharge and forest productivity (except Holm oak) were projected to decrease, whereas crop yields increased in these regions, where we assumed that irrigation would compensate for decreases in precipitation. The above results demonstrate how IRSs can be used to investigate the sensitivity of impact models to systematic changes in climate and socio-economic drivers. In the following, we examine some of the insights gained from application of the IRS approach as well as possible shortcomings. We focus on three aspects that relate back to the original objectives: (i) the realism of the modelled patterns of response, (ii) the evaluation of model sensitivity, and (iii) the wider applicability of the approach for informing adaptation. IRS plots such as those shown in Figs. 2, 3 and 4 facilitate the direct and systematic comparison of model behaviour across different indicators and across different regions or locations. However, the interpretation and realism of these responses needs to be judged in comparison to results from other studies. Given the diversity of impact models applied in this study and the Europe-wide scope of the analysis, it is not feasible in the space available to provide a detailed comparison of all IRS results against equivalent impact model outcomes reported in the literature. Instead, we offer examples for a few of the models that help to illustrate the types of insights that can be gained from such comparisons. The forest IRSs of changes in productivity indicated that the baseline climate is not economically viable for some of the species in several regions. This is broadly consistent with current distributions of the tree species (Tinner et al. 2016). In earlier work, forest productivity IRSs were prepared for individual sites across Europe using an ensemble of five forest growth models, although not all models were applied at all sites (Lindner et al. 2005). Some similarities in their results to those of this study can be found, for example for Scots pine, both with respect to the optimal temperature and general shape of the IRSs, in one of the two forest models for southern Finland and Germany compared to North-eastern and Central Europe, respectively. However, by way of caution, the results of Lindner et al. (2005) indicate considerable differences between different forest models. IRSs of river flow indicators simulated with WaterGAP have been presented previously focusing on annual water volumes and seasonality of water flows (Weiß and Alcamo 2011). Our results confirm some of the findings in the earlier analysis, namely that river flows are more sensitive to changes in precipitation than to changes in temperature with the exception of snow-dominated catchments in North-eastern Europe. The crop yield IRSs showed considerable differences in patterns of response between the eight European sub-regions. 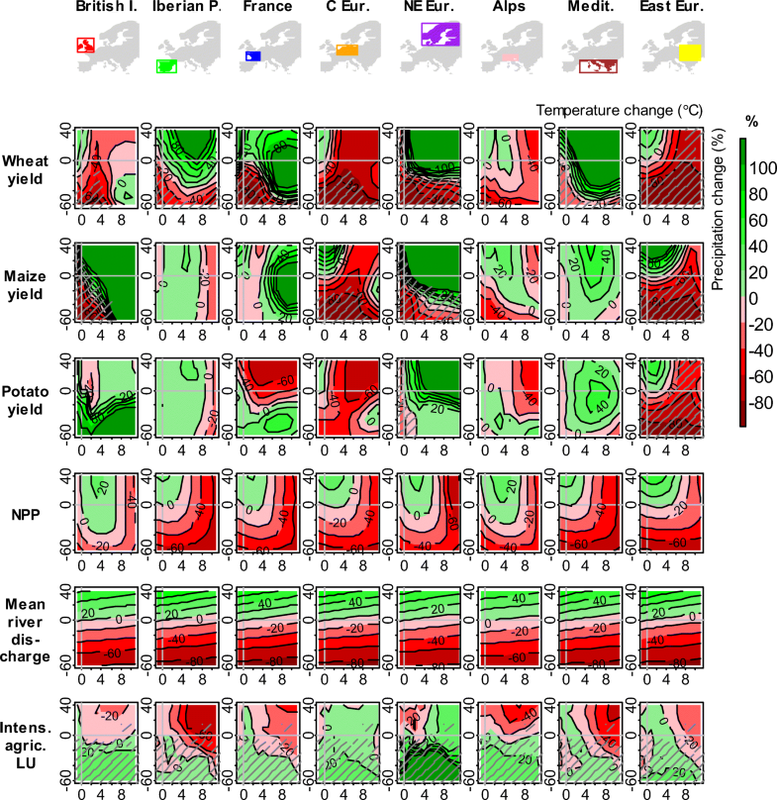 It is instructive to compare results for the wheat model with wheat yield IRSs constructed for four sites in Europe using a 26-member ensemble of wheat models (Pirttioja et al. 2015; Fronzek et al. 2018). The temperature changes giving the largest simulated yields were slightly above the baseline for North-eastern Europe but below the baseline for Central Europe. This is consistent with ensemble median results at sites in Finland and Germany, respectively, by Pirttioja et al. (2015). The highest yields for the Iberian Peninsula were also simulated for higher than baseline temperatures, which contrasts to the ensemble median results for a site in northern Spain (Pirttioja et al. 2015), although some individual ensemble members show a similar sensitivity (Fronzek et al. 2018). A possible explanation for these differences in optimal temperatures could be that Pirttioja et al. (2015) calibrated their models to site conditions for a rainfed crop, whereas the M-GAEZ model was applied here for a larger region and included irrigation. Some of the IRSs in this study showed non-linearities (e.g. for large warming in France and Central Europe) which were not found for 30-year averages in the site-based ensemble studies, even though some of those models have a more advanced structure and require more detailed input data than the M-GAEZ model used here. Fine-scale interpretation would certainly be more amenable to comparison if rainfed and irrigated crop responses were discriminated in the M-GAEZ model, though part of the discrepancy in results might also be explained as an artefact of ensemble averaging in the earlier studies, which may mask non-linear behaviour in some individual models (see below). The preceding discussion emphasises how the quantification of impact indicators using a single impact model may neglect important parameter and structural uncertainties that are increasingly being investigated using ensemble approaches (Warszawski et al. 2014). In principle, information about the uncertainty of impact estimates can be addressed in IRS analysis, as has been demonstrated in single-sector and location-specific IRS studies that have employed ensembles of impact models (Fronzek et al. 2011; Pirttioja et al. 2015; Ruiz-Ramos et al. 2018). Unfortunately, such ensembles were not available in this study. On the other hand, one of the benefits of displaying model sensitivity over a wide range of conditions and regions is that model behaviour can be readily scrutinised and possible deficiencies or errors detected. For example, the analysis carried out for this study by several modelling groups revealed model behaviour that prompted remedial action to correct calibration errors. Simplifying assumptions were necessary for several model simulations, such as aggregation to large regions, to 30-year periods and fixing [CO2] levels for crop yields (although elevated levels were considered in the land use model simulations). Furthermore, the IRS approach only considered changes in temperature and precipitation that were constant throughout the year, whereas climate model projections indicate that future climate changes will vary seasonally, though with differences between regions. Weighting schemes that account for seasonal differences in climate projections have been successfully applied in other IRS studies (e.g. Fronzek et al. 2010; Pirttioja et al. 2018). Some of the impact model outcomes for a given region were also influenced by impacts elsewhere. For example, the rural land use model simulates demand for land based on global markets affecting Europe, hence requiring that changes in local drivers used in the IRS exercise be aligned logically with scenarios used to represent global drivers such as commodity prices and trade. One objective of this study was to compare the modelled sensitivity of various indicators to key drivers in different regions of Europe. On an IRS, the relative sensitivity to a given driver can be inferred from the spacing of plotted isolines relative to the axis of the driver. The approach adopted here was based on Fronzek et al. (2018), who defined two metrics of sensitivity specifically for crop yield IRSs based on the location of maximum yield and the strength of response. Another possible approach (tested but not shown) could be to quantify the variability of impacts estimated across the perturbation combinations (e.g. the point locations shown in Fig. 1a), using the coefficient of variation or inter-quartile range. A similar approach was used to classify river flow IRSs by Weiß and Alcamo (2011). For simplicity and consistency, the IRSs for each region were constructed across common ranges of driving variables, defined to encompass plausible projections anywhere in Europe. Hence, the ranges were considerably wider than those projected over any specific sub-region. Whilst the use of a common perturbation range is perfectly valid for comparing model behaviour in different regions, it may not be so useful for assessing regional sensitivities under future conditions, where projections for the region lie well within that common range. For this reason, our comparison of regional sensitivity focused only on portions of the IRS, defined on the basis of plausible projections of temperature and precipitation for a given region, with only those indicators simulating sensitivity to these drivers selected for analysis, to allow direct comparison across regions. Neither sensitivity metric, however, described above discriminates between the sign of response (i.e. whether the sensitivity to a given driver is positive or negative). This was a key motivation for using the IRS plots to compute impacts across specific scenario perturbations (cf. Fig. 6), which allowed for an estimate and comparison of the sign and relative magnitude of impacts by the end of the twenty-first century under RCP8.5 climate projections. One of the pitfalls of averaging relative sensitivity to climate by region across the different indicators (as shown in Fig. 5) is that results may be strongly affected by outcomes from certain models and their assumptions. Hence, the intuitive expectation of high sensitivity of crop yields to precipitation in the seasonally dry Mediterranean region is not borne out in the median results. This indicates positive responses to warming and reduced precipitation (see Fig. 6) and is largely due to the assumption that irrigated area remains unchanged under such conditions. Sensitivity to precipitation is much greater in Eastern Europe as the crop production there is assumed to be predominantly rainfed. Other indicators in the Mediterranean do indeed show high sensitivity to precipitation change (e.g. river discharge, NPP and forest productivity). This study also examined sensitivities to socio-economic drivers, and models showed strong sensitivities across the range of perturbations tested. 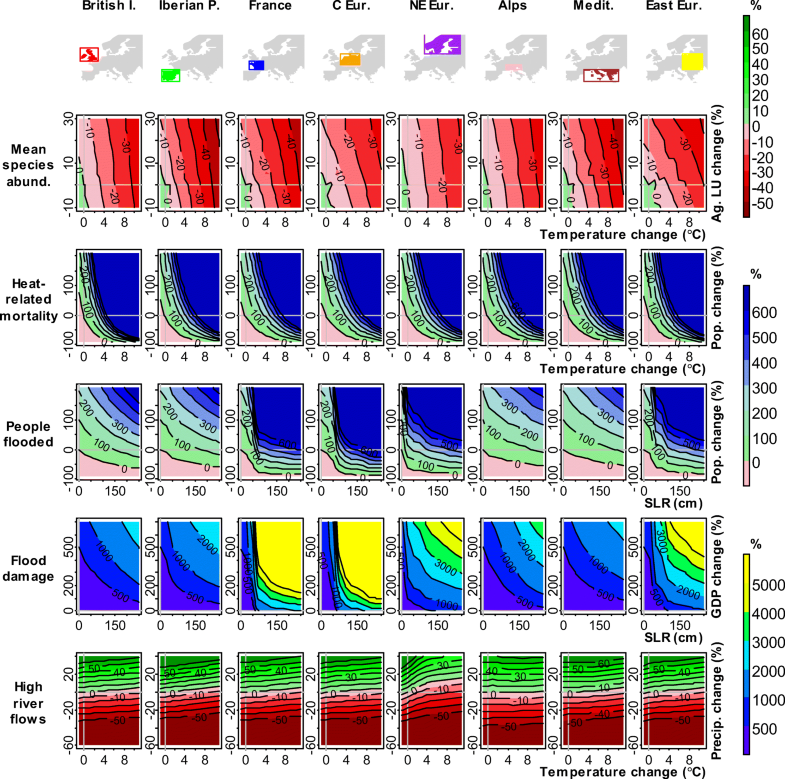 In human mortality and coastal flooding models, socio-economic changes act through the linear scaling of temperature effects (on mortality) or SLR effects (on flooding). The results indicate how important the specification of future socio-economic conditions can be alongside physical drivers. For example, the sensitivity to future GDP projections may be more important for coastal flood damage than the sensitivity to SLR, especially under high-end projections. A number of possible applications of the IRS approach can be identified, including its use in summarising and comparing multi-sectoral impacts and in representing adaptation. In this study, we have conducted IRS analysis using a number of impact models that were selected simply according to availability in a given research project. Although the representation of sectors and topics was fairly wide, it was by no means complete. For example, heat-related mortality was the only health indicator studied; other climate change-related health risks, such as changes in the distribution of vector-borne or infectious diseases, changes in food safety and synergies with various allergens (Kovats et al. 2014), were not accounted for in the analysis. For studies focusing on providing an assessment of representative impacts across different sectors in Europe, a larger number of complementary indicators would be required than were applied here. Several of the models used in this study are also part of the CLIMSAVE Integrated Assessment Platform (IAP—Harrison et al. 2015), which has been used to demonstrate the importance of considering cross-sectoral interactions (Harrison et al. 2016). However, cross-sectoral interactions have not been included in our analysis, in spite of evident linkages between sectors considered in this study (e.g. through land use, between coastal and river flooding, and between water availability and irrigation). Were these linkages to be modelled explicitly, they probably would have modified the sensitivity to changes in drivers. Future IRS work using a development of the CLIMSAVE IAP will explore some of these complex sensitivities. On the other hand, an advantage in keeping the models separate is that understanding the basic behaviour of each sub-model is more straightforward. The credibility of the IRS approach relies on a compromise between offering a robust representation of the modelled processes and their uncertainties whilst retaining the simplicity of the approach. For example, the choice of two key driving variables for constructing an IRS is not always straightforward, as multiple variables may have an influence on the impact outcome. For some of the indicators plotted in this study, separate IRSs were constructed for permutations of paired variables. The choice of impact model may also be critical for the outcomes and the use of model ensembles is to be encouraged (see discussion above). Some have argued that since ensemble averaged estimates often show greater predictive skill relative to observations than estimates from any individual model, ensemble averages would offer more robust estimates of future outcomes than single models for changed environments (e.g. Martre et al. (2015) for crop yields). This would imply constructing separate IRSs for individual models and then using the average (median or mean) response for synthesis. Others caution that if most models in an ensemble do not capture key processes (e.g. the effects of high temperature stress on crop yield), then the ensemble average outcome would provide misleading results even if some members of the ensemble offered accurate projections (e.g. Carter 2013). However, there is no dispute concerning the benefits of applying multiple impact models, if they are available and suited for the task. Another useful characteristic of IRS plots is that they can reveal potentially important system behaviour under plausible future conditions. Examples include non-linear responses to driving variables or the exceedance of impact thresholds (tipping points). Examples identified in this study include climate changes causing NPP decline and exceedance of thresholds of economic viability for forest productivity. These features may be highly policy-relevant for European adaptation planning in different sectors. However, the robustness of such features would need to be assessed in light of the models applied and contextual evidence from the literature. As a follow-up to this research, IRSs will be combined with explicit projections of future changes in driving variables, to investigate the uncertainties surrounding future impacts and the opportunities to ameliorate or enhance impacts through adaptation. For example, for heat-related mortality, adaptation has been shown to reduce the increase in mortality to up to 50% in some regions (Honda et al. 2014). In addition, probabilistic projections of drivers will be used to estimate the likelihoods of crossing critical impact thresholds. The sectoral indicators showed diverse sensitivities to climate and socio-economic changes, including (a) large regional differences in crop yields and in the allocation of land for intensive agricultural use; (b) distinct differences in potential stocking levels between tree species, with region-specific thresholds for temperature and precipitation changes; (c) only small regional differences in relative change of river discharge, with the exception of conditions under low warming in North-eastern Europe that shortened the snow season; (d) similar relative declines in biodiversity abundance with higher temperature across all regions; (e) the largest relative increase in heat-related mortality with warming over the British Isles and Mediterranean regions; and (f) significant impacts of coastal flooding in most regions for a sea-level rise above 50 cm, with coastal protection fairly effective below this level. Across the various impact indicators, the British Isles showed the smallest sensitivity to both temperature and precipitation, whereas Central Europe had the strongest median response to temperature and Eastern Europe to precipitation. The ratio of precipitation to temperature sensitivity was greatest over the Iberian Peninsula and least over the British Isles. When combining the IRSs with climate projections for 2071–2100, North-eastern Europe showed increases in yields of all (largely rainfed) crops and productivity of all tree species, whereas Central and Eastern Europe showed decreases. Indicators of river discharge and forest productivity (except Holm oak) were projected to decrease over the Iberian Peninsula, France and the Mediterranean, whereas modelled crop yields increased over the Mediterranean and Iberian Peninsula in spite of decreased precipitation, due to an assumption that most crops would still be irrigated. The impact of socio-economic changes (i.e. population and GDP) was demonstrably more important than climate across a plausible range of conditions, as indicated by IRS results for heat-related mortality, coastal flooding and land use. The study highlights the utility of IRSs as a learning device to better understand model behaviour and to facilitate the identification of non-linear responses to key drivers and potential tipping points of possible interest for adaptation planning. Two anonymous referees and the guest and chief editors provided constructive comments on an earlier draft of this manuscript. The authors would like to acknowledge financial support from the European Commission Seventh Framework Programme IMPRESSIONS project (grant agreement no. 603416), the Academy of Finland for the PLUMES project (decision 277276), the Environment Research and Technology Development Fund 2-1702 of the Environmental Restoration and Conservation Agency in Japan and JSPS KAKENHI Grant Number JP16KT0036.